To close out last week’s mathematically-themed comic strips … eh. There’s only a couple of them. One has a professor-y type and another has Albert Einstein. That’s enough for my subject line. Joe Martin’s Mr Boffo for the 15th I’m not sure should be here. I think it’s a mathematics joke. That the professor’s shown with a pie chart suggests some kind of statistics, at least, and maybe the symbols are mathematical in focus. I don’t know. What the heck. 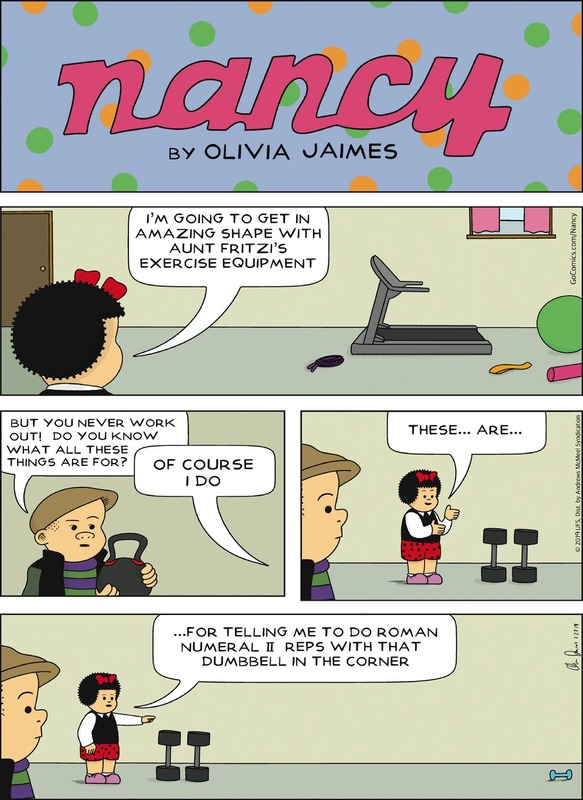 I also don’t know how to link to these comics that gives attention to the comic strip artist. 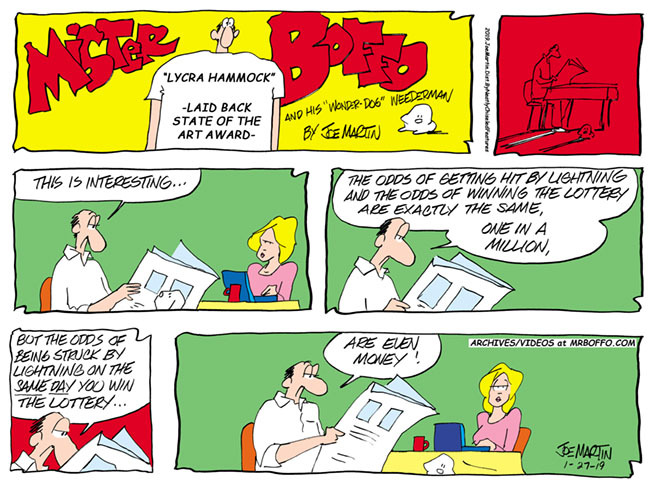 I like to link to the site from which I got the comic, but the Mr Boffo site is … let’s call it home-brewed. I can’t figure how to make it link to a particular archive page. But I feel bad enough losing Jumble . I don’t want to lose Joe Martin’s comics on top of that. Joe Martin’s Mr Boffo for the 15th of August, 2017. I am curious what sort of breakthrough in pie-slicing would be worth the Sara Lee company’s attention. Occasionally you’ll see videos of someone who cuts a pie (or cake or whatever) into equal-area slices using some exotic curve, but that’s to show off that something can be done, not that something is practical. Charlie Podrebarac’s meat-and-Elvis-enthusiast comic Cow Town for the 15th is captioned “Elvis Disproves Relativity”. Of course it hasn’t anything to do with experimental results or even a good philosophical counterexample. It’s all about the famous equation. Have to expect that. Elvis Presley having an insight that challenges our understanding of why relativity should work is the stuff for sketch comedy, not single-panel daily comics. Paul Trap’s Thatababy for the 15th has Thatadad win his fight with Alexa by using the old Star Trek Pi Gambit. To give a computer an unending task any number would work. Even the decimal digits of, say, five would do. They’d just be boring if written out in full, which is why we don’t. But irrational numbers at least give us a nice variety of digits. We don’t know that Pi is normal, but it probably is. So there should be a never-ending variety of what Alexa reels out here. By the end of the strip Alexa has only got to the 55th digit of Pi after the decimal point. For this I use The Pi-Search Page, rather than working it out by myself. That’s what follows the digits in the second panel. So the comic isn’t skipping any time. Gene Mora’s Graffiti for the 16th, if you count this as a comic strip, includes a pun, if you count this as a pun. Make of it what you like. Mark Anderson’s Andertoons for the 17th is a student-misunderstanding-things problem. That’s a clumsy way to describe the joke. I should look for a punchier description, since there are a lot of mathematics comics that amount to the student getting a silly wrong idea of things. Well, I learned greater-than and less-than with alligators that eat the smaller number first. Though they turned into fish eating the smaller number first because who wants to ask a second-grade teacher to draw alligators all the time? Cartoon goldfish are so much easier.